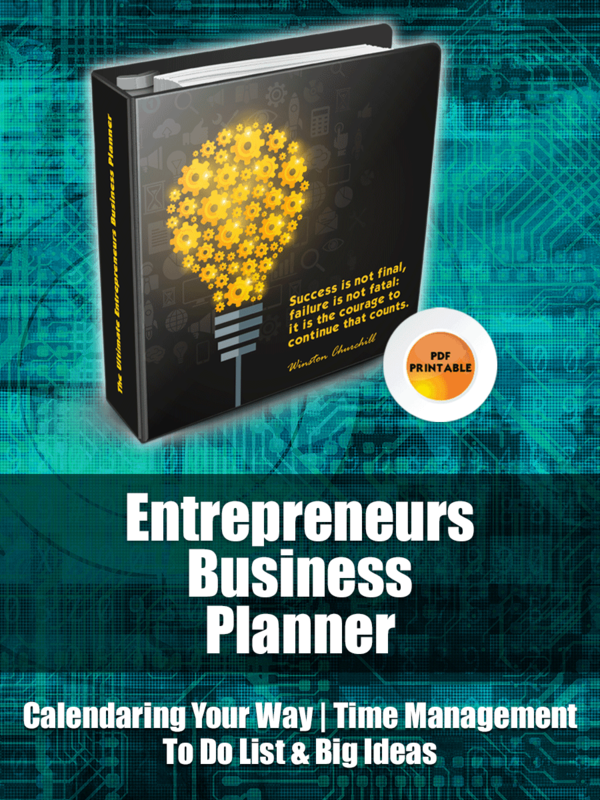 The Effective Entrepreneurs Business Planner encompasses everything you will need to keep your business on track and your ideas flowing. This printable PDF file will keep you up to date for years to come! Let’s dive right in and see all the parts that will get your life (and time) on track and in order! Some of the planner concepts in this journal are new and revolutionary (and something you might have never seen before!) With that in mind, many of the planner pages have a video link at the bottom so you can have a helpful walkthrough of how how to use the planner pages. In most planners you have to pick one or two ways to manage your time as if we all work the same way. But this calendar let’s you print out all different kinds of calendar pages at will. This works amazing for me as I go through the year and need different kinds of organization at different times. In the beginning of the year I have LOTS of to-dos and appointments and in the summer I am struggling to find time to work around my littles being home. I just use different pages depending on what I have going family or work wise. One of the big things that entrepreneurs struggle with is time. Somehow we feel like there is somehow enough time in the day to accomplish everything we want. These time management forms will help you to get handle on your time and what can actually be accomplished. Wrangling all of your to-dos can be a challenge sometimes. The lists can be LONG and not so productive. This system will help you take care of all those things that keep falling through the cracks. This is the section that may have saved me the most time in my business EVER. Instead of actually making websites and buying domains and starting projects, I just scope out my big ideas on paper. Some of them did make it to the production queue but most of them petered out when I really started thinking about them. There is NOTHING wrong with having lots of big ideas, it is just important that you make sure that they are going to be something that you complete, and not just something that is going to waste your time. I think it is so impactful for entrepreneurs as we go through our days with all the highs and lows that come about! Up is never going to stick around forever and even in our darkest moments of despair the only thing we have to do is get back up and keep fighting! I have been an entrepreneur since I was 8 years old and selling products in the store behind my parents house. And during all that time I struggled with keeping all my great ideas under control. I would start something and leave it hanging, too frustrated to EVER dream of trying to swing back and around and pick it up. This left little pieces of my soul lying out there doing nothing over the years and me feeling a like a complete failure from time to time. Now don’t get me wrong, I have had some glorious wins and created some products and services that I have absolutely adored, but I always felt like I was scrabbling to find a way to keep all my great ideas together. I tried tons of different calendars and planners…oh the money I have spent. In fact, if I think back I have probably bought two calendars a year for 15 years totaling at least $3,000 not counting the extra costs for covers, bags and the like. So I was planning on which calendar to get this summer (I KNOW, it is an addiction) and I remember so clearly riding up to pick up my daughter from girl scout camp when I saw a video about how to use the ARC Planner System from Staples…wait what? I could move things around, make my own journal and calendar? Oh and my peeps without the ARC could use a plain 3 ring binder off the shelf from Staples too? That was a day that will live in infamy for me. I started dreaming about the possibilities of not having to have sticky notes and notepads everywhere. Now I have all my ideas, hopes and business dreams in one single planner along with my calendar and blogging bits. I almost can’t believe this is real, that I will be helping so many business owners get their planning, calendaring and content organized. Thank you for checking this planner out and for being such an amazing entrepreneur!